The aim of this case was to identify a patient with Von Willebrands disease and arrange appropriate investigations. Von Willebrand disease (vWD) is a common, inherited, genetically and clinically heterogeneous hemorrhagic disorder caused by a deficiency or dysfunction of the protein termed von Willebrand factor (vWF). 3. total deficiency (type III). In order to determine whether further investigation is appropriate a bleeding history can be useful. • Initial haemostatic tests – FBC, PLt count, APTT, PT, Fibrinogen. If bleeding history is strong, consider performing initial VWB assays. • If one or more are positive : consider repeat assays, check VWF Ag: RCo ratio, multimer distribution, collagen binding, RIPA or platelet binding, FVIII binding, platelet VWF studies, DNA sequencing for VWF gene. • Characterized by gain-of-function mutations of the binding site for GP1bA, leading to rapid clearance of the platelet/VWF complex. o LD-RIPA is used to enhance platelet agglutination in the presence of gain-of-function mutations. Low dose of ristocetin does not cause binding and aggregation of platelets in sample from normal persons, but does cause VWF binding and aggregation of platelets in sample from patients with either type 2B VWD or patients with platelet type (pseudo) VWD (caused by a mutation in platelet GP1bA). o VWF platelet-binding assay (VWF:PB) differentiates between type 2B and platelet type VWD. This assays measures the binding of VWF to normal paraformaldehyde-fixed platelets using low concentrations of ristocetin. Patients with type 2B exhibits increased platelet binding, whereas people whi have platelet-type VWD have normal VWF:PB with low doses of ristocetin. • Treatment of these two conditions differs therefore it is important to differentiate between them. 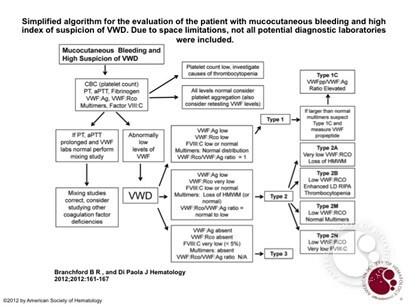 Type 2b is treated with VWF, and pseudo VWD requires platelet transfusion. This entry was posted in Inherited bleeding and tagged bleeding, LD-RIPA, Pseudo-VWD, type 2B, Von willebrands disease, VWF:PB. Bookmark the permalink.